You work hard all day. Between work and family commitments, you miss indulging the creative part of your brain. (Remember that?) And catching up with your besties is difficult. Some things just can’t be explained in a text. We get it. We have a solution that is quick, affordable, and totally indulgent. Come to Ayla’s for the evening! You and your girlfriends, your sorority sisters or your bridesmaids will have our undivided attention, since we will close the store for your private event. Our talented instructors are there to guide you through every step of the process as you make a beautiful necklace you can wear home. We’ll take care of all the details, including restaurant-catered noshes, non-alcoholic beverages (or BYOB), and dessert. When your guests arrive at the store, they will have a chance to choose the beads for their project from our wall of pearls. As you and your guests (up to 8) are catching up and nibbling, we will explain the basic project to you and show you how to use the beading tools we loan to you for the evening. When the necklaces are near completion, we’ll show you how to secure them. From first arrival to finish, allow three hours for a truly wonderful night out. Cost is $89 per person for dinner, beads, and instruction. Would you like to take your team out after work for a relaxed, company sanctioned, team building event? Are you eager to teach your team members how to listen to the creative sides of their brains? Jewelry-making can help do that! Call Ayla (847-328-4040) and speak to her about your ideas. We will customize and accommodate our skills to your needs, budget and schedule. This fun get-together makes it easy to bead with your friends or loved ones. 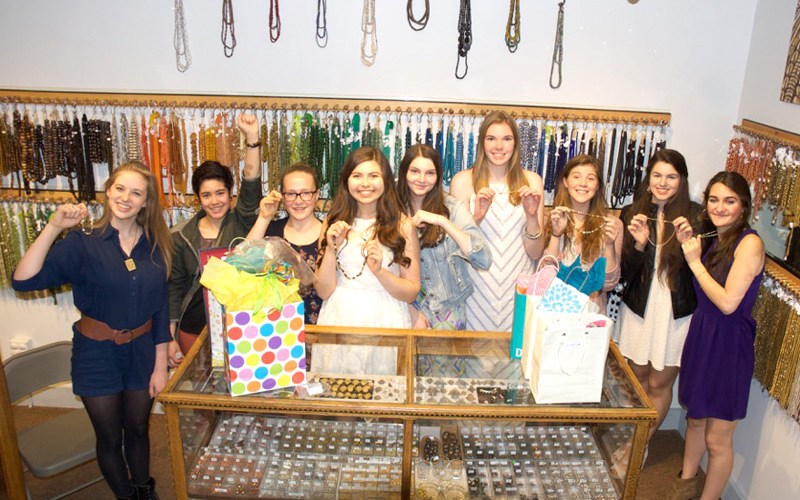 For only $25/ person, you and your friends can meet at the store for your own private event, and create a beautiful piece of jewelry! We provide the environment, whatever guidance and instruction you require, and loaner tools. We will work with you to make sure each guest goes home with a finished piece of jewelry. For the little princess in your life, here’s a party to make every little girl’s dream come true. The Princess Birthday Party includes a balloon bouquet and a tiara for the birthday girl, as well as a gift bag for each member of her entourage (up to 10 children). Inside the gift bag is a Bead Mix Box and other fun party favors. 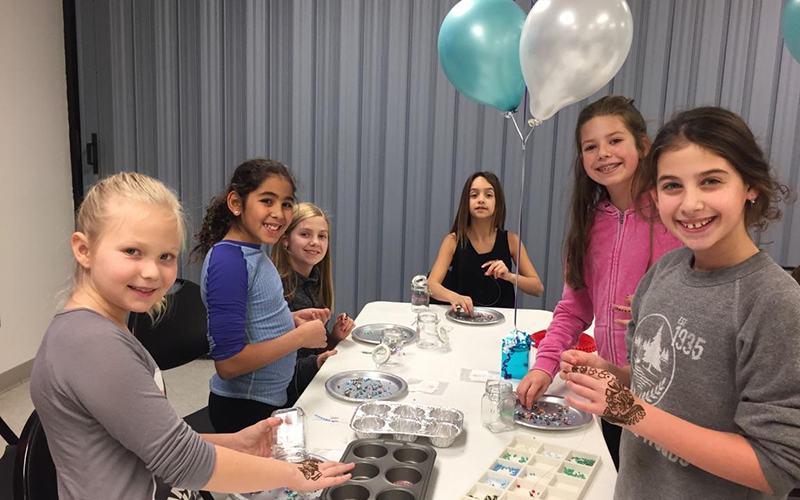 We will use the Bead Mix Box during the event to make a necklace; the remainder of the beads, including directions, will be saved to go home with each guest to create a second piece of jewelry. 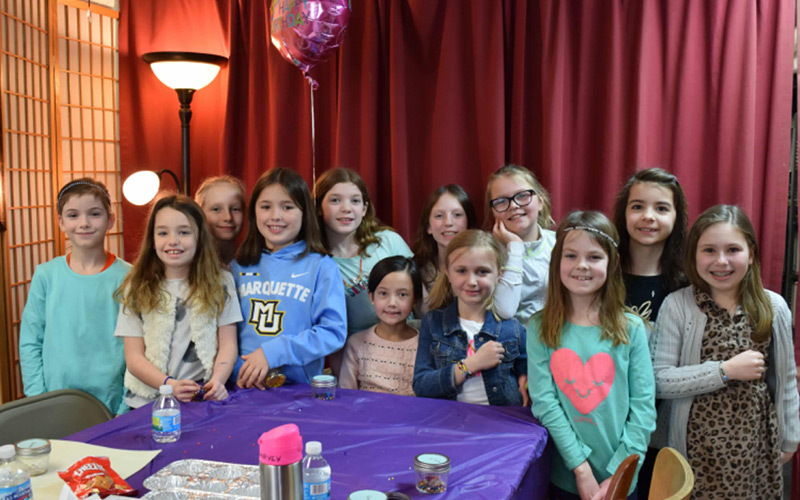 This party is perfectly suited for any princess age 8 and up. Our caring and helpful staff will guide each of your young guests as they create a unique piece of jewelry suitable for wearing home. This 2-hour package, which includes instruction, materials, a birthday cake, and a group photo is only $45/child. Are you hosting a party at home, or some other venue, and need a fun activity to add to your special event? Let’s make some jewelry! Our instructors are available to come to a location of your choosing, within a 10-mile radius from the store, for only $100/hour per instructor (2-hour minimum). We recommend one instructor for every 6 people. Each instructor will be available to provide basic instructions to your guests. All materials for your event are available for purchase at Ayla’s Originals. Our instructor(s) will bring loaner tools to your event so you don’t need to purchase multiple sets. If you choose to purchase beading supplies elsewhere other than at Ayla’s, we will charge a $100 tool usage fee per event. If you request it, we will also bring finishing supplies (crimps, crimp covers and clasps) to your event, which will be added à la carte to your bill according to our set retail prices. We are happy to work with you to put together a project that best fits your group’s age, motor skills and budget. If you would like to have your event professionally photographed, contact Ayla. All packages can be adjusted to include the services of Joseph Studios. Beaders are a special community. Come join us every Thursday between 5 PM and 7 PM for Bead Therapy. 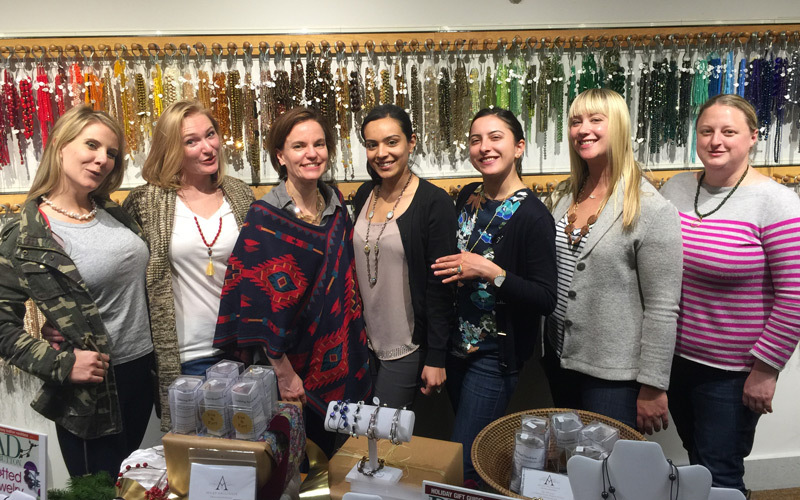 You will experience the meditative and soothing power of beading with some of the nicest people in Evanston. We’re biased, but to know us is to love us! Do you have an idea for a group project? Are you interested in a unique and customized activity? Call Ayla (847-328-4040) and speak to her about your ideas. We will customize and accommodate our skills to your needs, budget and schedule. For any private event held at Ayla’s with food or beverage, we require a $200 security deposit to protect against excessive wear and tear. If there is no damage to the store, this fee will be credited back to you within 48-hours of your event. Ayla’s Originals is conveniently located next door to a municipal parking lot; there is also street parking available at metered spots.